I finally decided to dive into the new tessellation shaders, and I am quite pleased. Going into it I thought it would be very specific to gaming applications, but as I've found out it is surprisingly general. New primitive topologies have been added for tessellation. Since the basic unit for the new shaders are patches and control points, the new types allow you to render anywhere from 1 to 32 control points per patch. Say you're using 16 control point patches. The vertex shader is run per control point, and the output from this stage is passed into the hull shader. The hull shader is really described in two parts; one being a patch-constant function, and the other being the hull program. The patch-constant function computes user-defined data and is run once per patch. This allows you to compute things that remain constant across the entire patch. The required output from the patch-constant function are tessellation factors: these tell the tessellation hardware how much to tessellate the patch. The hull program is run once per output control point, and both the patch-constant function and hull program can see all control points. 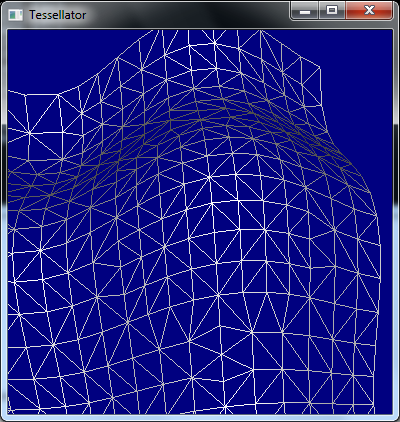 The next step is the actual tessellation, which is performed in a fixed-function, yet configurable stage. The tessellator ONLY looks at the tessellation factors output from your patch-constant function. The user-defined output from the patch-constant function and hull program are provided to the domain shader, which is run after tessellation. 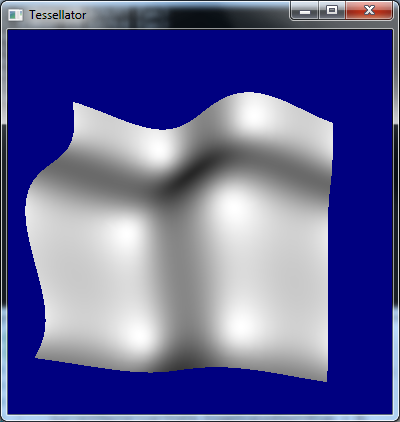 The domain shader is run per-tessellated-vertex and is provided with the tessellated vertex location on the patch. To me it seems that the domain shader can be seen as a post-tessellation vertex shader; this is where you transform the tessellated vertices. The output from the domain shader is provided to the geometry shader (or pixel shader, if not using a geometry shader). 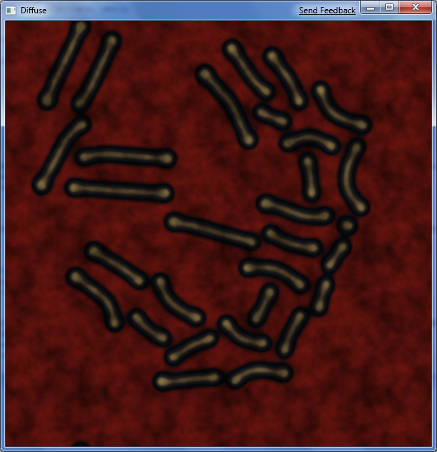 The toughest part to me is computing the per-patch tessellation factors. But since this is completely programmable, it's a fun problem. I did some more fiddling with D3D11's new types and have learned new things about them. First, it seems that it is not possible to read from multi-component RWTexture* and RWBuffer objects due to a hardware limitation. 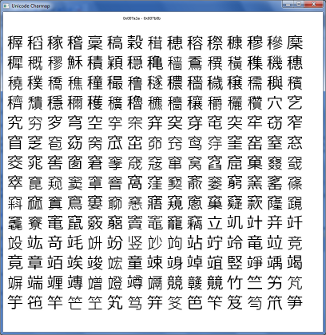 However, it is possible to read-write the 32-bit RGBA type thanks to the way D3D handles views. Create the texture with a DXGI_FORMAT_R8G8B8A8_TYPELESS format, then for the unordered access view cast it to DXGI_FORMAT_R32_UINT. This allows for a common texture format to be read/written without ping ponging, which is great for in-place transformations. There is another reason why this is not a major limitation. Consider applications whose requirements are reading and writing a texture, but also use shared memory to reduce texture fetching. This most likely means that there is overlapped texture fetching going on (e.g., for an image convolution), and so ping ponging two textures is necessary here anyway to prevent clobbering of data between shaders. I have found the new structured buffer types to be much more flexible since they are independent of the texture subsystem. It is possible to read/write any structure and any element of a RWStructuredBuffer. Any shader can read from structured buffers, and the compute and pixel shaders can write to them. According to John Rapp on the DX11 forum, this type also has beneficial performance characteristics. It should be noted that a structured buffer cannot be bound to the input assembler (not that you'd want to since you can just read from it in a random access manner), and cannot be the output of a stream-out operation. I consider these limitations minimal, since really, the input assembler probably should be going away sometime soon. As for stream out, one can just stream out to a regular Buffer and read from that. The March 2009 SDK Direct3D 11 documentation mentions that the AppendStructuredBuffer and ConsumeStructuredBuffer types operate similar to a stack in that items are appended and consumed from the end of the buffer. If this is true, this is a very nice property to have. This means it is possible to append to a structured buffer in one pass, and bind it as a plain old StructuredBuffer in another pass (for example, indexed by SV_InstanceID in the vertex shader). Or, filling up a RWStructuredBuffer in one pass, then consuming from it in another pass. I haven't played around too much with the ByteAddressBuffer type. From my experiments, it seems that StructuredBuffer is the way to go for most things. It seems that these replace Buffer for me in most of my applications. I am excited to see that there are new sample applications that show off the capabilities of DirectWrite. Having used Direct2D, DirectWrite and the Direct3D 11 previews, I would like to discuss some of the limitations I have run into. Direct2D has the ability to render into Direct3D textures. However, D2D does not deal with resource views directly; it uses DXGI's facilities to access surfaces. 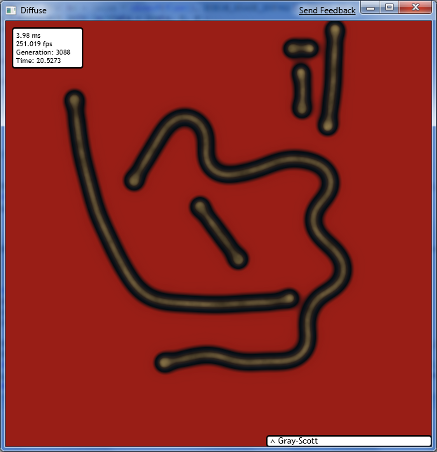 The problem comes when trying to obtain the DXGI surface representation of a 2D texture that has more than one mip in its mipmap chain and/or more than one layer. Unless I am missing something, this is simply not possible. This means that it is not possible to use D2D to render directly into a Direct3D multilayer texture (or mipmapped texture). Admittedly, I have not found myself needing to do this very often. Indeed, the most useful application of D2D/D3D interop to me has proved to be rendering to the backbuffer, which is neither mipmapped nor multilayered. 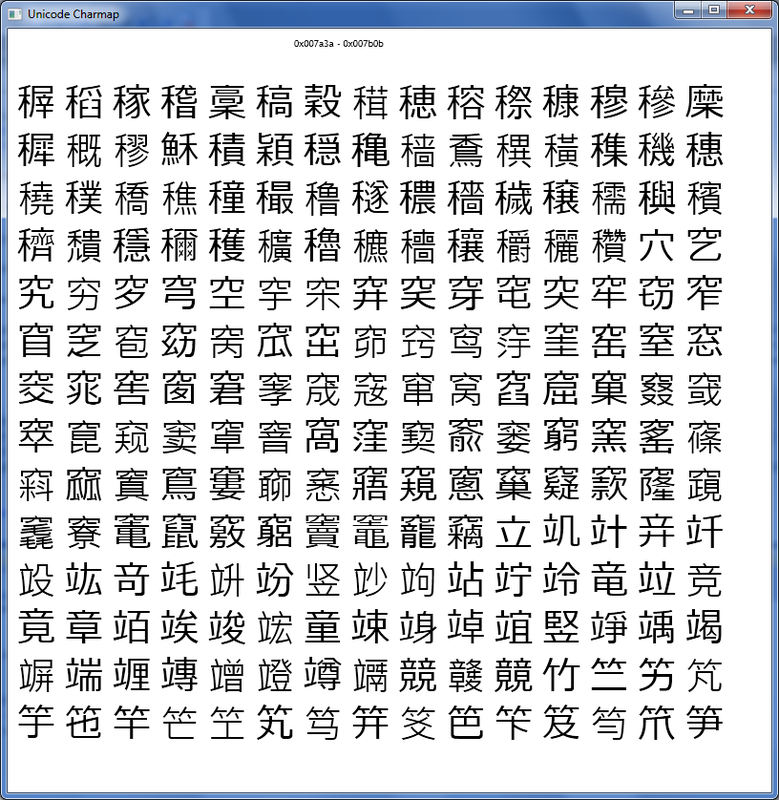 In one scenario, however, I needed to render some numbers into a texture array. I had to create a temporary texture without any mipmap/layers, render to that using D2D, then perform an on-device copy to get it into my texture array. This copy could be eliminated in two ways. One way involves adding a D3D dependency to D2D, which is not the best route. The second way involves a modification to DXGI to enable the casting of multilayer/mipmapped 2D textures to surfaces; it would be nice to be able to pass in a subresource number and get a surface representing a particular subresource of a 2D texture. The second limitation I have run into is in the compute shader. I dislike how the number of threads per group is declared in the shader, and cannot be changed during runtime without a shader recompile. I really do not see the need for this limitation, as both OpenCL and CUDA allow the number of threads per group to be specified at runtime. That aside, I still prefer Microsoft's approach to computation on the GPU. I like that it is integrated into the Direct3D API and uses a language similar to the other shaders. Aside from these minor limitations, my expectations are definitely surpassed with regard to Direct2D and DirectWrite. I think these APIs fill in a large gap in the Windows graphics API collection. I recently installed the VS2010 beta so I could experiment with some of the new C++0x features. In this post, I would like to cover a few simple lambda examples. Let's start off simple - without lambdas. Suppose we have a vector allocated for 100 floats, and we want to fill it up with random numbers in [0,1). The most obvious way is to use a looping construct of some kind. Now consider the slightly more complicated example where we have two vectors and want to produce a third vector from them. We can use a variant of std::transform() to do this. We have vectors invec1 and invec2, and want to produce outvec which is simply the elementwise product of invec1 and invec2. Windows 7 introduces a number of new APIs. In this post I would like to focus on ITaskbarList3. With this interface, it is possible to turn your application's taskbar button into a progress bar, as well as control what shows up as the thumbnail preview. It is even possible to add buttons to the preview window, as depicted below. I heavily use Direct3D in my Windows graphics programs. So why would I want to use an API meant for 2D graphics? The answer is simple: text rendering. Text rendering has always been a massive pain in 3D APIs, but rightfully so. Why should a low-level GPU API care about text? One solution to this is to write one's own text rendering class. I would much rather use a standard library, though. That's where Direct2D and DirectWrite come into play. As I mentioned in a previous post, Direct2D is actually independent from Direct3D. You can write an application that only uses Direct2D and never actually touch Direct3D in your code. (Direct2D, of course, uses Direct3D internally). This may sound inflexible when wanting to mix it with Direct3D, but the situation is quite the opposite. Thanks to DXGI, it is possible to obtain the DXGI surface representation of a Direct3D texture and hand it off to Direct2D. I demonstrate a simple example. In this program (a 3D vector field plotter, as a matter of fact), I am interested in displaying the time it takes to render a frame, as well as a simple performance log graph. I was able to eliminate a good chunk of D3D code and replace it with a small section of D2D code. Big deal, right? Check this out. How about a thicker line in the performance graph, and with a dashed stroke style? I plan on posting more complete code snippets later, but for now I will get right down to the fundamental code. The first eye-pleasing line creates a DirectWrite factory object. We then use the factory to create a new text format. 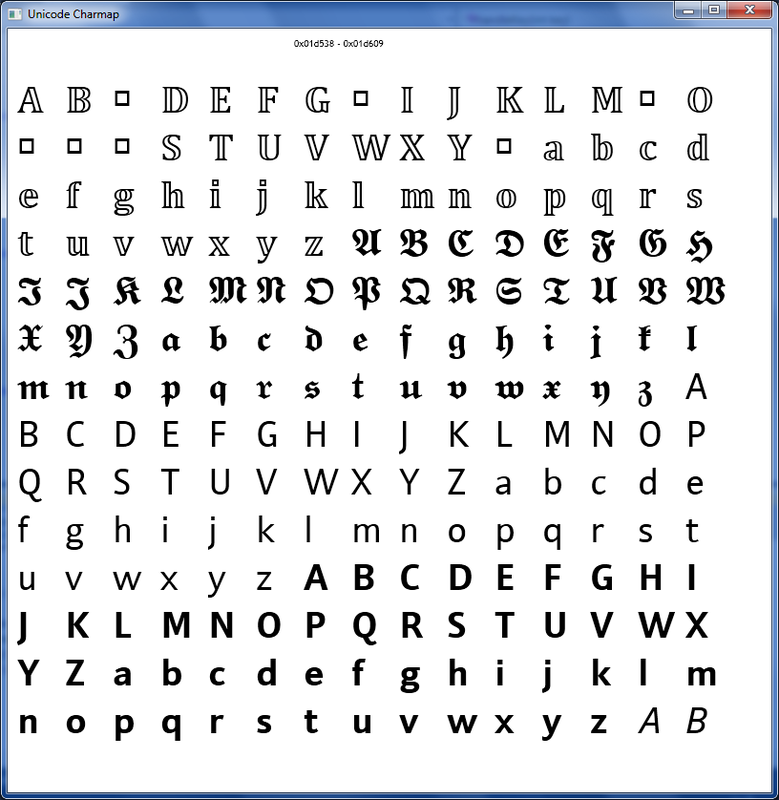 A text format encapsulates basic information such as the font, font weight, font style, font size, etc. We then use Direct2D to draw the string. 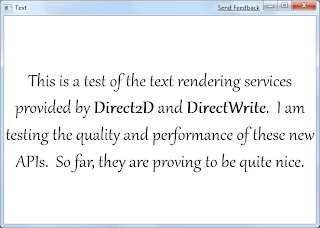 As can be seen above, one of the arguments to the DrawText function is the DirectWrite text format we created earlier. In a future post I will cover in greater detail how I obtained m_spBackBufferRT. I have not forgotten about OpenGL: in such situations I highly recommend the QuesoGLC text renderer. I expect to write up QuesoGLC examples as well in the future. 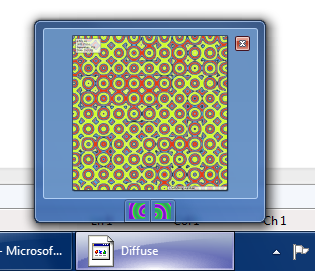 I recently installed the Windows 7 SDK so I could experiment with Direct2D and DirectWrite. 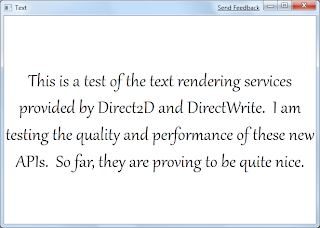 I am very pleased with the APIs; they definitely simplify the text handling in my Direct3D applications. One of the great design points of Direct2D is that it can inter-operate with Direct3D textures through DXGI. Expect code snippets and screenshots soon! Direct3D 11 introduces a number of new datatypes to HLSL. The (RW)ByteAddressBuffer type is a buffer that is DWORD-aligned byte-addressable. What this means is that I can pack an arbitrary mix of scalar and struct types into a buffer, and then pull the data out with a cast. The RWBuffer type is simply an extension to the Buffer type in that it allows reading and writing in pixel and compute shaders. 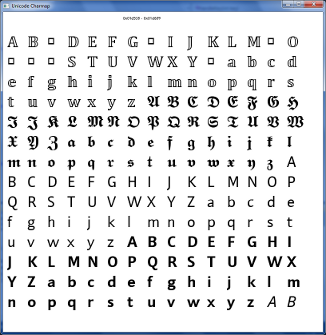 Next, we have the read-write texture types. These new types will have exciting new possibilities and will eliminate the need to ping-pong two textures in some cases. These types are pixel-addressable. Finally, we have the stream data types. The stream types are meant for applications that deal with variable amounts of data that need not preserve ordering of records. For example, say we want to emit per-fragment data from the pixel shader, but not into a texture. We can define a structure that describes a fragment, and then we can emit the structures. Now say we would like to process each fragment in a compute shader. A 2D imposter is a simple representation of a geometric shape. Why would we care about these? Imagine rendering millions of circles. Not only would the vertex shader be a bottleneck, but the quality would not be very good due to multisampling. Instead, we can use imposters. In this example, I am rendering each circle as a simple quadrilateral. The real magic happens in the pixel shader. Let's take a look at the shader code. The utility of imposter shapes shows through when looking at the vertex shader. The vertex shader need only run 4 times per circle. As you can see, I am not only transforming the square's vertices, I am also passing the raw vertices over to the pixel shader. The pixel shader uses this to measure the distance between the center of the square and each fragment in order to determine which fragments should be visible and which should be blended away. Why use imposters? 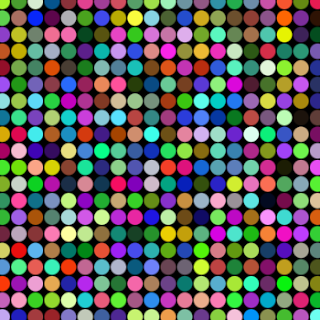 Consider a visualization application which needs to render thousands of circles very quickly. This method allows for the rendering of efficient, high-quality circles. In a future post, I will show how this method can be adapted to rendering spheres as quadrilaterals.